Welcome to Green Hill Central! Well sorry if this is a bit late but for those who haven't seen this yet, it's the latest trailer for SG showing 3 new levels! We also get to see a bit of Classic Tails action and how they amazingly converted the old levels fit to Modern Sonic's gameplay. Also on some stages, there will be small parts where you can visit small levels so it's like stages in stages! It's kinda hard to explain but I'll guess we'll know soon enough. Also it's been confirmed that on the 3DS version, Emerald Coast will be making it's appearance! 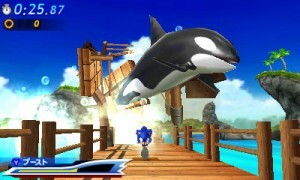 It's amazing to see that whale again chasing you, too bad for the console version though. 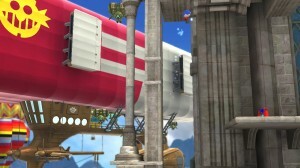 Well finally we're getting to see Chemical Plant Zone in SG. I'm satisfied with what I've seen with Classic Sonic's stage and was amazed by Sega's new ideas for Modern Sonic's stage! The water slide was full of win and the remix was just plain badass. Well what do you guys think? Share your thoughts below. Also sorry if I haven't been able to update lately, being a senior student in high school really eats up my time. Modern City Escape Music and Others! Some of you may have heard of this already but for those who haven't yet, this is the modern music for City Escape which was remade by the same singer years ago! Tell us what you think about this remix of Escape From The City below! Also, Sega officially confirmed Chemical Plant zone for SG and the Metal Sonic boss battle so let's wait for more information about that! Happy Belated 20th Birthday Sonic The Hedgehog!!! Yes, it's our Blue hedgehog's Birthday lat Jun. 23rd and I was only able to do this today because of stuff I've been dealing with on school but hey, it's better to be late than never! Soon I'll be posting some stuff that' been going on on SOS 2011 but I'll give you guys some updates for our Blue Blur's 20th anniversary. First some music rips from the SG demo! Title Screen Menu Music GHZ Classic GHZ Modern GHZ Modern "Boost"
Also, a bonus for you guys! The nine stages that I previously posted were already official so I guess it's what we have to stick with but it's still awesome anyways. 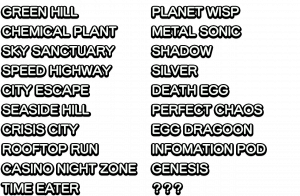 I also got my hands on the list of bosses for Sonic Generations but I'll put it in a link if you guys don't wanna be spoiled. Classic Theme of City Escape in SG! Another nostalgia trip for you guys! I was roaming around my subscriptions and I happen to stumble upon this classic version of City Escape for Classic Sonic! Sure is catchy, I'll make sure to post the new modernize City Escape once I find it on the net.